When Bob watches Fred's world, he can see every point in his world at once. He can see Fred's insides, what's inside his safe, what's underground, where the quarter he lost is, everything. Fred is basically naked to Bob, even though he has clothes on. Bob would be able to touch Fred's insides without having to go through Fred's skin, and there's nothing Fred would be able to do about it to stop him. Bob doesn't realize it yet, but he is also exposed. Emily can see every part of his world at once. She can see inside his tightly locked safe, into his refridgerator, into his desk drawers, and she can see his insides. Bob is basically naked to Emily, even though he feels fully clothed. She can touch any part of his insides without having to go through his skin or his clothes. One day, Bob is feeling particularly devious and decides to remove the contents out of Fred's safe. He walks over to Fred's world, removes Fred's money from inside the safe and sticks it onto Fred's table. Bob doesn't have to open the safe because he can just bring it out of planespace into realmspace, move it, and then put it back into planespace. The money doesn't have to go through the walls of the safe because it can just pass "over" its walls in realmspace. Fred comes in from a leisurely walk in the woods and is astonished to see all his money lying on the table. He was sure he had put it in the safe the night before. He checks out his safe, but nothing has happened to it. He opens it up, and it's empty. He sticks the money back into the safe, and makes sure it's closed securely. As soon as Fred closes the safe, Bob grabs the money again and puts it on the table behind Fred. Fred turns around to see the money he had just secured now lying behind him. Now Fred thinks he is going crazy. Emily has seen what Bob did to Fred, so she decides to teach him a lesson by doing the same thing to him. Bob has his journal locked up in his safe, which has both a combination lock and a key lock on it. Bob knows his safe is secure because he bought the best safe on the market and only he knows the combination to it. Emily removes the book from the safe by pulling it into tetraspace. She moves it over to Bob's desk and reinserts it back into realmspace. The book didn't have to go through the walls of the safe because it could go "over" its walls in tetraspace. Bob is reading another book and looks up to see his journal sitting right in front of him. He is quite stunned and confused, because he was sure he had put the journal into his safe. He checks out the safe, and there seems to be nothing wrong with it. He takes the journal and puts it back into his safe, making sure it's definitely locked. He even ties a rope around the safe so that he can see if anyone tampers with it. He returns to his desk and resumes his reading. Emily grabs the journal again, moving it to tetraspace and inserting it back on the table in front of him. When Bob looks down and sees the journal in front of him again, he thinks he is going crazy. He looks back to see the rope still tied around the safe, exactly the way he left it. Then he remembers what he did to Fred, and realizes that someone else may be doing the same thing to him. Bob decides to have some more fun and tease Fred again. Fred's world is hanging on Bob's wall, but not tightly. 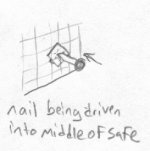 Bob takes a nail, and right in front of Fred's view, he hammers the nail right through Fred's world. All of a sudden Fred sees a circle appear in midair. He decides to investigate, so he grabs it and tries to move it, but it won't move. It is thoroughly fastened in mid air. This is rather bizarre and he decides to try some things with the floating circle. He sits against a wall of his house and pushes against the circle with his feet. It requires a lot of effort, but the circle moves. It feels like he is holding up the whole world, and in reality that is what he is doing. When Fred lets go of the circle, it swings back to its original position and Fred falls to the ground. 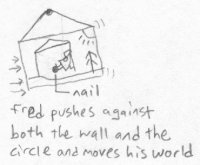 Bob removes the nail, so Fred sees the circle suddenly vanish. Bob raises Fred's safe into the air and drives a nail through the middle of it. He lets it go, and the safe hangs in mid air on the nail. The nail didn't have to go through any of the walls of the safe in order for the safe to be hanging. The nail just went through the air through the inside of the safe. This is similar to hanging a loop with a nail on the wall in realmspace - the loop itself doesn't have to be pierced, but the nail has to go through the area in the middle of the loop. 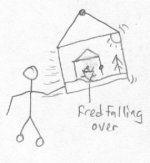 To Fred, the circle was just a strange object hanging in mid-air, but now Fred's own safe is hovering. Fred opens his safe and looks inside, and to his surprise he sees that the circle has reappeared, but now his safe is hanging on it. Fred removes the safe from the "hook" and puts it back on the ground. This has been enough bizarre events for one day, so he goes outside to get a breath of fresh air. Emily sees that Bob hasn't learned his lesson. She does the same type of thing to Bob with the hope that Bob will realize what's happening to him. 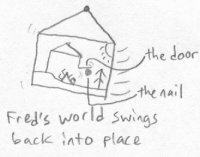 She has Bob's world hanging on her wall and she drives a "tetranail" (four-dimensional nail) through his world. Bob sees a sphere suddenly appear in midair near a wall. He remembers what he just did to Fred, and to test out his hypothesis he does the same thing that Fred did. He sits back against the wall and pushes against the sphere with all his strength. He succeeds in pushing it a few inches, but it requires a lot of effort. When he lets go, the sphere swings back to its original position and he falls on the floor. Bob is starting to realize that something else is out there. Emily also performs the "Levitating Safe" trick. She raises Bob's safe into the air and drives the tetranail through the air in the middle of it. Emily didn't have to pierce any of the sides of the safe in order to hang the Bob's safe on her wall. Bob opens the safe and sees that the safe is hanging on the sphere, just like Fred's safe was hanging on the circle. He pulls the safe off of the levitating sphere and places it back on the floor. Emily decides to play another trick on Bob. Bob has a plant hanging from his ceiling by a chain. Emily holds the plant in the air while she pulls one of the chain links into tetraspace. She puts the chain link back into realmspace at a different location and lets both the plant and the chain link drop to the floor. Bob sees this and walks over cautiously to inspect the scene. He sees a plant on the ground with dirt everywhere, a single chain link intact sitting next to the plant, and the rest of the chain hanging from the ceiling, intact. None of the chains had to be bent or broken open for Emily to perform her trick. Bob couldn't have played this particular trick on Fred because chains aren't possible in planespace. Bob decides to continue playing tricks on Fred so that he can see what the equivalent is in his own world. Bob decides to try rocking Fred's world back and forth along the wall. Since Fred's world is swaying back and forth, he can't hold his balance and falls over. One surface of Fred's world scrapes against the wall, but on the other side is only in contact with the air in Bob's world. Fred's world can only move two directions and still be in contact with the wall. If Fred's world is moved in a third direction (outward), it is no longer in contact with Bob's wall. Emily watches what Bob has done and does the same thing to Bob. She has 4 directions she can push Bob's world to and still have it scrape against her wall. First she pushes it front and back, then left and right. To Bob it feels like there's an earthquake happening. Emily stops Bob's world from moving, then starts it moving around in circles. This whole time, all of Bob's world is scraping against Emily's wall, not falling off. 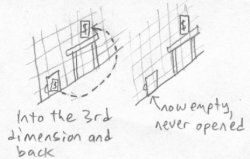 If Emily moves Bob's world in a fifth direction (outward), then it is no longer in contact with her wall.